Odfjell Terminals’ Korean site is located in Ulsan, the most important petrochemical distribution and transshipment hub in Northeast Asia. 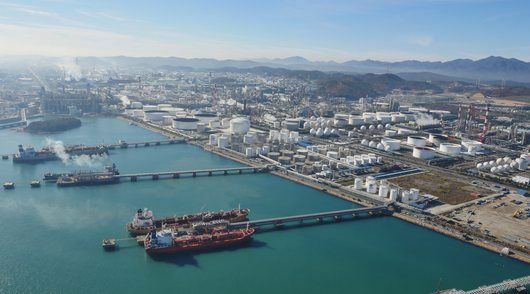 Odfjell Terminals Korea (OTK) is a state of the art terminal for storage and distribution of petrochemicals, and one of the most sophisticated terminals in Ulsan. The location is optimal for serving as a distribution hub for China, Taiwan, Japan and Korea. The terminal can handle virtually all kinds of chemicals, including toxic, flammable, reactive and corrosive. OTK has received several awards from government agencies for its contribution and commitment to a safe and healthy environment for its employees and for the community at large. The terminal is built and equipped to meet Odfjell’s high safety and environmental standards. OTK owns and operates six berths, with user rights to another two berths available for vessels of up to 80,000 dwt. To serve incoming and outgoing ships, OTK makes use of six berths with a maximum of 14.3 meter water depth, with one available to accommodate vessels up to 100,000 dwt. Road tank trucks and iso-tank containers are handled at OTK’s 17 bays. OTK also offers comprehensive drum filling and container stuffing services. All the tanks are located immediately adjacent to, and at the same elevation as the docks, which is optimal for operational efficiency. Odfjell holds 25.5% of the shares in OTK.